Celebrate back-to-school season at Barceló Beach Resorts with these two last minute summer packages offering savings of up to 40 percent off. It’s not too late to hop in the car and save this Memorial Day weekend - stay 3 nights or more at any Wingate by Wyndham or Ramada hotels and receive 20% off your stay. Here are five last-minute U.S. city breaks where you can kickoff the start to summer and celebrate Memorial Day for less. National Memorial Parade. Washington D.C.What better place to be patriotic than the nation’s capital? Events in the area include the National Memorial Day Concert and the National Memorial Day Parade. Perfect for last-minute trips from: Baltimore; Boston; Charleston, S.C.; Columbus, Ohio; Hartford, C.T. ; Louisville, K.Y. ; Nashville; New York City; Providence. Are you one of the 56.7 million* Americans with Irish ancestry? Discover your family roots and track down ancestors with the help of a professional genealogist on this wallet-friendly Discover Your Roots: Genealogy Vacation now on sale at the Aer Lingus Vacation Store. The 6-night Ireland vacation package starts at $1,399 and includes air, car, 5-star hotel accommodations, 5 nights at a B&B and genealogy consult. This flexible ancestral journey offers the opportunity to visit historic castles, archaeological sites and scenic attractions as you experience first-hand the villages of family legend and possibly run into long lost relatives at a local pub. With pre-paid lodging vouchers and rental car, you’re free to set your own pace as you trace your family history. Staying in traditional Irish homesteads or modern working farms, you’ll experience life as a local and enjoy the warmth and hospitality of the Irish people. River rafting. Sun salutations. Mother Nature. Wallet-friendly savings. Women looking for a restorative summer adventure will appreciate this women-only, yoga-focused rafting trip down the Green River through Utah’s Desolation Canyon with Holiday River Expeditions. Whether you are new to rafting, new to yoga, new to the outdoors or looking for a new girlfriend getaway, this June 2 - 6, 2014 trip welcomes women of all abilities and ages. Book by April 30, 2014 and receive $150 off. Not your standard yoga retreat for the uber-fit, this wellness vacation is designed for ALL women including those who struggle with weight, arthritis, chronic pain, sports injuries, MS, aging or mobility related issues. Leading the yoga will be Deanna English, a registered nurse, yoga therapist, and integrative health coach. Rafting splashy rapids that build in intensity each day. Big beach camps with plenty of room for yoga. Excellent inflatable kayaking opportunities. Dramatic canyon scenery. Great hiking. Plenty of down time. Fresh delicious meals. Scenic flight. Heads-up budget travelers…Generator, the world’s fastest-growing hostel brand, is celebrating the first anniversary of Generator Barcelona with a €1 flash sale* and early bird access now available. From March 18th at 8 a.m. EST to March 19that 8 a.m. EST, travelers will be able to book as many beds as they want online for the incredibly low rate. Travel is valid for stays between March 18, 2014 to March 17, 2015. Click here to claim the offer early. In addition, all guests who book a bed for €1 a night will be automatically entered to win a free upgrade to the Penthouse Suite where rates start at €250/$344 per night. *Based on availability, city tax of €0.72 per night per person not included. I’m not a fan of consumer holidays. I am a fan of affordable travel, however. So, if a Colorado ski break, an Italian hiking holiday, or an all-inclusive Mexico beach escape is on your travel wish list, here are four Cyber Monday travel deals to help you save big. The deal: Park Hyatt Beaver Creek Resort and Spa, located in the heart of Beaver Creek at the base of one of Colorado’s most celebrated mountain resorts, is offering Cyber Monday savvy-shoppers a free night stay and a free day of skiing! Those who book the Ski Free, Stay Free offer can enjoy an extra night as well as an extra day on the slopes. In addition, those who book on December 2 will receive a slope side view upgrade based on availability. This deal represents a 20% savings on accommodations and savings of $200 for skiing. How to save: To make reservations for this four-night stay, visit http://beavercreek.hyatt.com/en/hotel/offers/offer-detail.html?offerId=52910544 and use promo code CYBER. Offer is valid for stays between December 3-20 and throughout select dates in 2014. Please check the terms and conditions for availability. To make reservations for this four-night stay, please visit http://beavercreek.hyatt.com/en/hotel/offers/offer-detail.html?offerId=52910544 and use promo code CYBER. Offer is valid for stays between December 3-20 and throughout select dates in 2014. Please check the terms and conditions for availability. 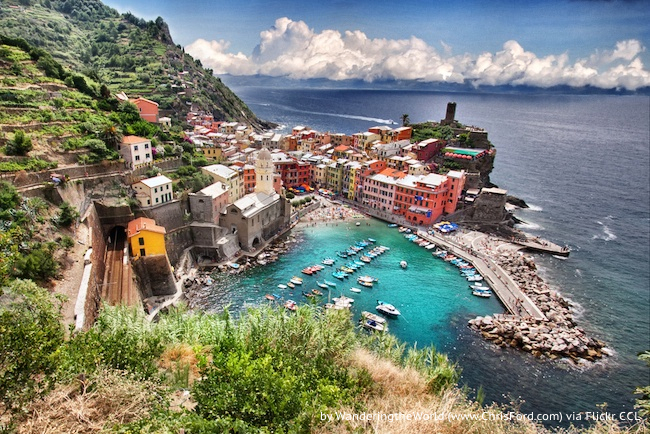 The deal: REI Adventures, a leading adventure tour company, is offering a Cyber Monday deal on its classic Cinque Terre Hiking trip in Italy. Guests who book this trip on December 2, 2013 will receive $700 off any 2014 departure of the trip, a 20% discount. The trip is a stunning tour by foot through the five picturesque fishing villages dotting the Mediterranean Coast of Italy. Guests will hike along dramatic views of the coastline, through chestnut and pine forests and past a 16th century naval fortress – all the while enjoying the region’s renowned wines, gastronomy and relaxed seaside culture. The deal: Barceló Hotels & Resorts specializes in all-inclusive resort experiences found in the world’s most desirable locales. The brand’s two multi-resort mega complexes, Barceló Bávaro and Barceló Maya, are characteristic of Barceló’s high quality service and endless entertainment options. Catering to online travel consumers, the brand is offering a 40% discount on stays with a three-night minimum. How to save: Reservations must be made on Monday, December 2 though the savings is valid for travel throughout 2014, blackout dates may apply. To book, visit http://www.barcelo.com/BarceloHotels/en_GB/offers/cybermonday-deals.aspx. The deal: Sandos Hotels & Resorts is offering up to 50% off at one of Sandos’ four all-inclusive Mexico resorts. The brand’s Mexico collection includes: Sandos Caracol Eco Experience Resort and Sandos Playacar Beach Experience Resort, both in Riviera Maya; and Sandos Cancun Luxury Experience Resort in Cancun. Sandos Finisterra Los Cabos is the fourth and newest Mexico property in the collection, which opened May 2013. Only available for booking on Cyber Monday, December 2, 2013. Valid for travel in 2014; blackout dates may apply. How to save: To book, visit www.sandos.com, select the Sandos Mexico hotel of choice and then click on the special offers tab at the top of the hotel landing page. It’s no secret that Peru is one of South America’s hottest destinations with Amazon adventures, the Sacred Valley of the the Incas and Machu Picchu, plus some of the best cuisine on the planet. But the price of getting there isn’t always wallet-friendly. Move quickly and you can fly for less with LAN Airline’s BIG DEAL Summer Sale on flights to and within Peru. Fly from the U.S. to Lima, Peru with fares starting at $549* and see more of Peru when you visit an additional domestic destination for $14 or LESS. Tickets must be booked together before August 5, 2013 for travel between August 15 and December 5, 2013. Switzerland ranks as one of the prettiest places on the planet. It’s also one of the most expensive. But that doesn’t mean budget travelers have to steer clear. Here are five wallet-friendly summer deals to help you stretch your dollars and expand your fun. Better still, discover how you can win a free one-week Swiss summer holiday. Latest & Greatest: The newest property from Generator, Europe’s fastest-growing hostel brand, opened this week (14 May, 2013) in Barcelona with beds starting from just €13 per person, per night. Located in the fashionable Gràcia district, smack dab in the middle of Barcelona’s two main Metro stations of Diagonal and Verdaguer, and as little as 15 minutes away from la playa, this hip new hostel hotel is as wallet-friendly as it is gorgeous and amenity packed. With free Wi-Fi, a stylish bar and chill-out areas, 24-hour security plus a free walking tour of the city, this cool new hostel is definitely bookmark worthy. Are you looking for a summer getaway? To help you start planning, and save some money while you’re at it, Destination Hotels & Resorts is offering big saving to those who book early with its Countdown to Summer promotion. The collection-wide promotion offers special discounts on summer lodging throughout Destination’s portfolio of hotels, resorts, condominiums and vacation rentals with discounts, upgrades, and added-value packages. Make the most of your tax refund dollars with St Maarten’s Sonesta Resorts’ new, “Tax Back? You Bet!” promotion, a 46% savings on any all-inclusive vacation booked during the entire month for travel the entire year. The resort is offering an additional 21% off (symbolizing the amount of tax & service) on Sonesta’s already low “advance purchase rate” - for a total of 46% savings off published rates. TRAVEL SAVINGS: Overseas Adventure Travel Reduces 2013 Heart of India Prices by up to $1100 per person. “The scent of roasted cumin seeds floating through a Delhi bazaar … a young girl’s bracelets jangling on her arm as she prepares for a festival … Hindu pilgrims descending ghats into the holy Ganges.” Sound tempting? Overseas Adventure Travel (OAT) invites travelers to discover India for less this year, reducing prices on its popular Heart of India adventure by up to $1100 per person for all August, September and December 2013 departures. In addition, there are no book-by dates and single supplements are free. I love it when an inside connection turns me onto exceptional savings on vacation experiences that I can pass along and share. Here are two last-minute deals offering incredible wallet-friendly discounts on March 2013 European river cruises that you won’t find anywhere else. Combined savings are more than $3,000 pp, but you’ll have to act fast. Booking deadlines are January 17 and 21, respectively. Hope it helps get you Out There!